I don't know what I love most about nachos. 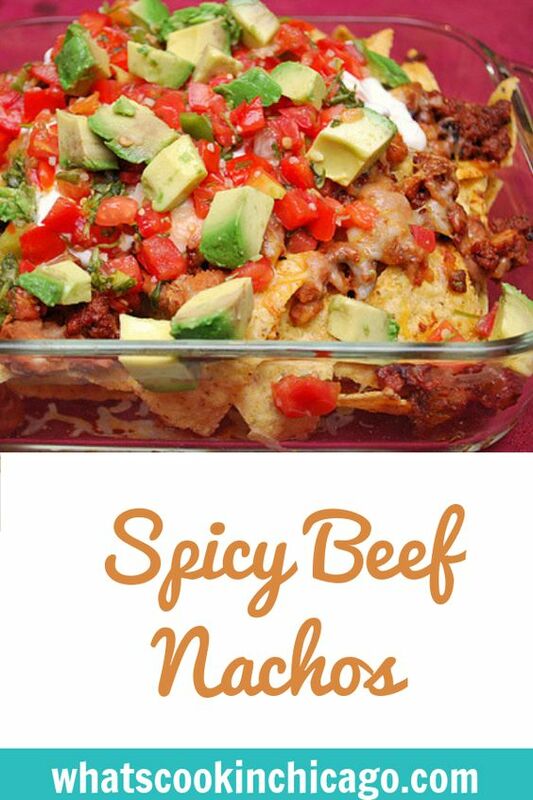 It could be the hot, crispiness of the chips that have been lightly salted, seasoned ground beef with a slight kick of spice, the smooth, warm, buttery cheese drizzled all over the top or the pickled slices of jalapeno to give it a little heat what I do know is that all those things together make for a great nacho platter. The down side is that sometimes restaurants make nachos out of slightly stale chips, the ground beef is bland and greasy, the cheese is oily and I get more jalapeno juice than jalapenos. But this recipe tackles all those concerns and this is one amazing nacho recipe you'll have to try at least once during football season. Through this recipe, I learned that the order in which the ingredients are topped is important. The beans are layered on first since they are easy to spread. Next is the seasoned beef layer so it can adhere to the beans (thus soaking up an potential greasiness). Then finally, shredded cheese is sprinkled on top of everything. But it doesn't stop there. This recipe has everything layered again so there are actually 2 layers of chips, beans, beef and cheese. The whole thing is baked to heat up and melt the cheese. 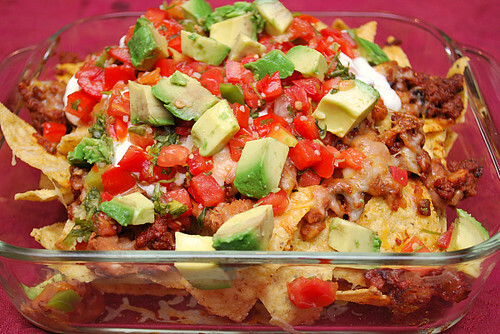 Once it's out of the oven, the entire nacho dish is topped with salsa and garnished with sour cream and diced fresh avocados. You just might even take your eyes off the game and really savor what you're eating! In a medium bowl, combine tomato, onion, jalapeno pepper (to taste,) cilantro and green onion. Season with garlic powder, salt and pepper. Stir until evenly distributed. Refrigerate for 30 minutes. Combine the beans and cheese together in a small bowl and set aside. Heat the oil in a skillet over medium heat until hot. Cook the onion until softened. Add the garlic, cayenne, cumin, oregano, and salt. Cook until fragrant. Add the beef and cook until no longer pink, breaking up the meat into smaller bits with a wooden spoon and scraping the skillet bottom to prevent scorching. Add the tomato paste, sugar, chile, and adobo sauce and cook until the paste begins to darken. Add the water and bring to a simmer. Continue to cook over medium low heat until the mixture is nearly dry. Stir in the lime juice and place the mixture onto a towel lined plate. Preheat the oven to 400 degrees. Spread half of the chips on a large, ovensafe 9x13 serving dish or platter. Dollop half of the bean mixture over the chips and spread evenly (it might be a little challenging but do the best you can.) Next, scatter half of the beef mixture over the beans, then top with 1 cup of the cheddar and 1 cup of the hot pepper jack cheese. Sprinkle half of the sliced jalapenos over the cheese layer. Repeat with the remaining chips, beans, beef, cheese and jalapenos. Bake until the cheese is melted and just beginning to brown. Top with salsa and garnish with sour cream, diced avocado, cilantro leaves, scallions, or however you'd like to top your nachos.